Dale Mabry Highway represents an important north-south commuter route from the Tampa peninsula northward to Carrollwood, Northdale, Lutz and Land O' Lakes. Collectively four different routes make up Dale Mabry Highway from MacDill Air Force Base to the merge with U.S. 41 just north of the Hillsborough County line. Florida 573 follows the southernmost section from the military base 1.90 miles north to Gandy Boulevard. U.S. 92 runs north-south along Dale Mabry from there to Hillsborough Avenue by Drew Park. Florida 580 dog legs 2.97 miles north along the highway from Hillsborough Avenue to Busch Boulevard by Carrollwood. Florida 597 runs on the northern half of Dale Mabry for 10.64 miles through unincorporated Lutz. Dale Mabry Highway is almost universally referred to by its name or simply "Dale Mabry" by locals in place of any of its numbered counterparts. Heavy commercial development along Dale Mabry Highway and expansion of the suburbs northward from Tampa to areas like Citrus Park and Northdale swelled traffic counts and added congestion to the arterial route. Plans envisioned to address traffic in 1981 included converting a portion of the highway to a controlled access parkway. This led to the grade separated interchanges at both Hillsborough Avenue and Busch Boulevard. Further work was never completed due to preexisting development along the corridor.2 The Veterans Expressway was eventually built in 1994 to provide relief. 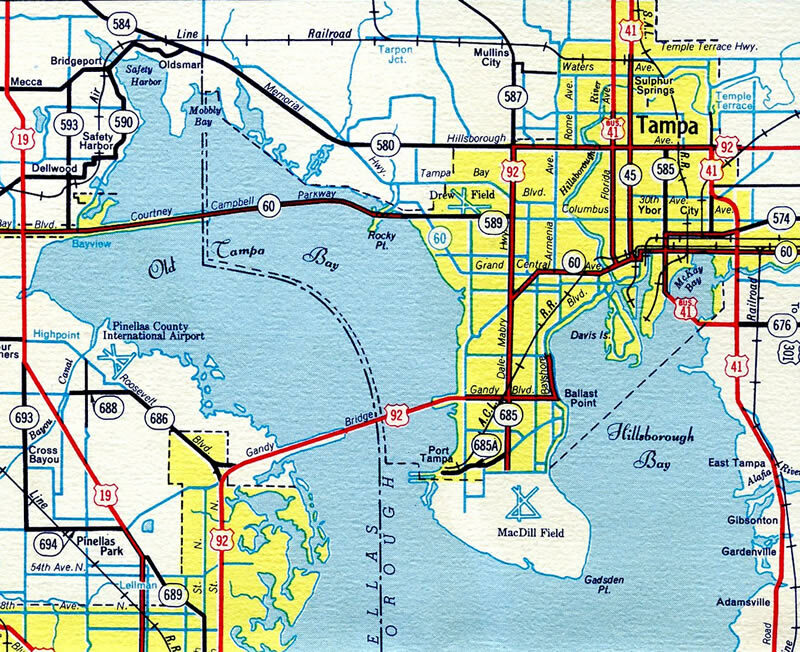 Dale Mabry Highway ran wholly within the city of Tampa per the 1955 Florida Official Highway Map. The south end was originally signed as an extension of Florida 685, which joined Dale Mabry Highway from Henderson Boulevard. Numerous shopping centers and big box retail lines the State Road 597 section of Dale Mabry Highway northward from Busch Boulevard to Northdale. Beyond there, some rural stretches remain amid a mixture of commercial and residential development to County Line Road. This includes a half diamond interchange built at the end of the Veterans Expressway (SR 568). Big box retail again fronts the east side of SR 597 in southern Pasco to its wye intersection with U.S. 41. Linebaugh Avenue intersects Florida 597 (Dale Mabry Highway) to the immediate north of the folded diamond interchange with Busch Boulevard and Gunn Highway. Linebaugh Avenue exists in three sections. Two sections are located east in the city of Tampa while the segment here ventures through Carrollwood to become a major arterial to Westchase. Photo taken 06/01/14. A mileage sign appears after Linebaugh Avenue for the SR 597 destination of Land 'O Lakes. The unincorporated community in Pasco County centers around U.S. 41, north of SR 54. Photo taken 06/01/14. Lake Carroll Way arcs northeast from Dale Mabry Highway as a tree lined gateway to a number of leafy neighborhoods surrounding Lake Carroll. Photo taken 01/18/14. Hudson Lake provides another link to the Lake Carroll area to the east of the Dale Mabry Highway commercial strip. Photo taken 06/01/14. Stall Road connects Florida 597 (Dale Mabry Highway) with parallel Orange Grove Drive beside Lake Ellen to the east and the Emerald Greens Golf course community to the west. Photo taken 05/16/15. Fletcher Avenue follows as a major east-west route from South Village Drive and Carrollwood Village east to north Tampa and the University of South Florida area. Portions of the arterial route double as unsigned County Road 582A to a state maintained section (SR 579) between U.S. 41 Business and U.S. 41. Photo taken 05/16/15. The first reassurance marker for Florida 597 stands just north of Fletcher Avenue as Dale Mabry Highway bends west to circumvent Bay Lake and Little Bay Lake. Photo taken 05/16/15. Handy Road spurs west from adjacent Ehrlich Road to intersect Florida 597 (Dale Mabry Highway) opposite North Village Drive. North Village Drive winds west through the Carrollwood Village golf course community. Photo taken 05/16/15. Florida 597 bends back to the east and next enters the busy intersection with Ehrlich Road west and Bearss Avenue east. Ehrlich Road comprises the main route west from Carrollwood and Northdale to the Veterans Expressway. The east-west section is discontinuous in name with the north-south section by Bay Lake due to Bearss Avenue. Photo taken 05/16/15. Bearss Avenue winds east as a busy commuter route to Lake Magdalene, north Tampa, where it meets Interstate 275 as State Road 678, and Bruce B. Downs Boulevard to North Tampa. Ehrlich Road west forms a slow moving arterial to Gunn Highway at Citrus Park. Photo taken 05/16/15. A second shield for Florida 597 north appears after Bearss Avenue, reflecting the former status of the east-west road as County Road 678. Photo taken 05/16/15. Zambito Road runs along the back side of adjacent North Pointe Shopping Center to tie into Dale Mabry Highway opposite Carrollwood Springs Boulevard west. Photo taken 08/23/16. Northdale Boulevard follows as the main road into the 1970s developed Northdale community west of Dale Mabry Highway. Photo taken 05/16/15. Mapledale Boulevard stems west from Dale Mabry Highway to Vivian Gaither High School and Northdale Boulevard from this traffic signal. Photo taken 08/23/16. North Lakeview Drive loops east from Florida 597 at Northgreen Avenue as the lone through road for the North Lakes development. Photo taken 08/23/16. A sound wall abuts the east side of Dale Mabry Highway by North Lakes. Photo taken 08/23/16. North Lake Drive returns to end at Florida 597 north at the ensuing traffic light. Photo taken 05/16/15. Trailblazers for the Veterans Expressway (SR 589) appear one mile ahead of Van Dyke Road (CR 685A) at Lutz. SR 597 passes along the east side of Lake County Park on this stretch. Photo taken 08/23/16. The Veterans Expressway (SR 568) ends directly at Dale Mabry Highway north of Van Dyke Road (CR 685A). However there is no access to the Suncoast Parkway northbound from that connection. Motorists instead must take CR 685A west to its interchange with SR 589 to head north into Pasco County. Photo taken 08/23/16. The SR 568 leg of the Veterans Expressway travels west from SR 597 in half mile directly to a wye interchange with SR 589 south. Photo taken 08/23/16. Van Dyke Road originates at Simmons Road near Brant Lake to the east. Westward the county road meets the Suncoast Parkway in 2.8 miles and ends in 4.5 miles at Gunn Highway (CR 587) in Lake Fern. Photo taken 08/02/16. Florida 597 (Dale Mabry Highway) retained a rural feel to the east end of the Veterans Expressway prior to the 2015 development of the Promenade at Lake Park development along the east side of the highway. Photo taken 09/07/14. One quarter mile ahead of the left turn for the Veterans Expressway (SR 568) west. Photo taken 08/23/16. Turn lanes were added for the Promenade at Lake Park in 2016 just ahead of the Dale Mabry Highway intersection with the Veterans Expressway. SR 568 west to SR 589 south leads toward Interstate 275 at Westshore in Tampa. Photo taken 08/23/16. 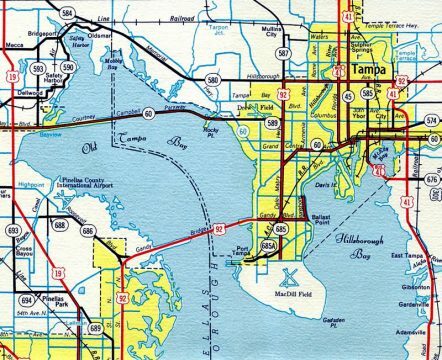 Florida 568 was designated in 2001 when the Suncoast Parkway opened as an extension of Florida 589 north from Lake Fern to Brooksville and Hernando County. The route defaults motorists onto Florida 589 south back toward Tampa International Airport (TPA) and Florida 60 west to Clearwater. Photo taken 08/23/16. The end of SR 568 was reconfigured in 2015-16 into a single signalized intersection with new Atmore Grove Drive. Atmore Grove Drive is main entrance to the Promenade at Lake Park. Photo taken 08/23/16. Prior to development along the east side of SR 597, a stub end was built into the Veterans Expressway at Dale Mabry Highway. The partially built diamond interchange would have accommodated the unconstructed Lutz Expressway from the east. Photo taken 09/07/14. Dale Mabry Highway turns to the northeast from SR 568 by the Cheval golf course community through north Lutz. Photo taken 08/23/16. Traffic lights were added to the intersection of Florida 597 north at Calusa Trace Boulevard west and Exciting Idlewild Boulevard east to accommodate increased traffic from a new apartment complex and assisted living facility built to the east in 2016. Photo taken 08/23/16. Lutz Lake Fern Road (former County Road 582) travels west from SR 597 to Villarosa, Brooker Creek Preserve and CR 587 (Gunn Highway) at Keystone. CR 582 once extended west to the Pinellas County line, where CR 582 remains in place to Tarpon Springs. The road travels locally along a stair stepped route east from Dale Mabry Highway to Oscar Cooler Sports Complex and U.S. 41 at Lutz Branch Library. Photo taken 09/10/15. The final reassurance marker for SR 597 stands north of Lutz Lake Fern Road (old CR 582). This stretch of Dale Mabry Highway remains rural. Photo taken 09/10/15. County Line Road connects Dale Mabry Highway with U.S. 41 just to the east at Willow Bend Parkway. The road spurs west to a handful of rural residential streets. Photo taken 09/10/15. Entering Pasco County, Florida 597 is now within the unincorporated suburban community of Land O' Lakes. Photo taken 09/10/15. A pair of big box stores line the east side of Dale Mabry Highway to its end at U.S. 41. Photo taken 09/10/15. Florida 597 defaults onto U.S. 41 north through Land O' Lakes while a single turn lane provides return access along the US highway southbound back into Lutz. No shields are posted here otherwise. Photo taken 09/10/15. Dale Mabry Highway branches southwest from U.S. 41 at a wye intersection east of Lake Como. A reassurance marker is missing from the southbound beginning of SR 597. Photo taken 08/15/15. County Line Road intersects Florida 597 south at the Hillsborough County line. The road spurs west locally to Lake Holly and Moss Lake while providing a through route east to U.S. 41 at Willow Bend Parkway. Photo taken 08/13/18. The first shield for Florida 597 appears after County Line Road along Dale Mabry Highway southbound. Photo taken 08/15/15. Dale Mabry Highway remains rural to the traffic light with Lutz Lake Fern Road. Formerly County Road 582, the east-west road connects SR 597 with U.S. 41 beyond a stair stepped route around Oscar Cooler Sports Complex and Hobbs Lake. Westward, former CR 582 ventures across northern areas of Hillsborough County to the Villarosa development, Lake Fern, Keystone and Pinellas County where CR 582 is posted to Tarpon Springs. Photo taken 08/15/15. Florida 597 turns more westerly from Lutz Lake Fern Road between Lake Allen and Thomas Lake. Photo taken 08/23/16. Approaching Calusa Trace Boulevard, motorists along Dale Mabry Highway south see the first guide sign for the Veterans Expressway. Designated as Florida 568, the east-west leg of the expressway links Florida 597 with Florida 589 leading south into Tampa. Photo taken 08/23/16. Development of the Promenade at Lake Park along land east of SR 597 resulted in the installation of traffic lights at Calusa Trace Boulevard west and Exciting Idlewild Boulevard east. Photo taken 08/23/16. State-named trailblazers for Interstate 275 were installed at the various interchanges with the Veterans Expressway starting in spring 2015. Photo taken 08/23/16. Changes made to the Veterans Expressway as part of 2014-16 widening project southward through Hillsborough County eliminated cash-based toll transactions. All tolls are collected via Sunpass transponders or by toll-by-plate where motorists receive a bill via the mail. As such all signs for SR 589 were changed out to reflect the electronic only tolling options. Photo taken 02/02/18. A second trailblazer for Interstate 275 replaced a previous assembly posted next to the adjacent guide sign for SR 589. The Veterans Expressway in conjunction with Memorial Highway (SR 60) lead motorists 17 miles south to I-275 at Westshore in Tampa. Photo taken 08/23/16. A ramp departs from SR 597 (Dale Mabry Highway) south to the Veterans Expressway west ahead of a signalized intersection with SR 568 east and Atmore Grove Drive. There are no exits on SR 568 to the merge with SR 589 south. Photo taken 02/02/18. The junction between Dale Mabry Highway and Veterans Expressway was reconfigured from a half diamond interchange to a conventional intersection in 2016. This accommodated Atmore Grove Drive, the main entrance to the Promenade at Lake Park development. Construction partially removed roadway stubs on SR 568 left over from when the Lutz Expressway was planned to extend the route east toward I-275. Photo taken 08/23/16. A reassurance marker for SR 597 south stands after the east end of SR 568. The left turn bay was added here in 2016 for the aforementioned housing development. Photo taken 08/23/16. Approaching Van Dyke Road (CR 685A) on SR 597 (Dale Mabry Highway) south. Van Dyke Road leads west from adjacent Northgate Square Shopping Center to parallel SR 568 to the Suncoast Parkway. There is no access to SR 589 north toward Brooksville from SR 568 west, so CR 685A west provides the connection. Photo taken 08/23/16. Installation of SR 589 shields with yellow toll banners in 2015 claimed the lone CR 685A shield posted on Dale Mabry Highway. Photo taken 09/07/14. Hillsborough County 685A lines all of Van Dyke Road from Simons Road near Brant Lake to the east and west by Lake Carlton to the Suncoast Parkway (Exit 14) and the end at Gunn Highway (CR 587) by Keystone Lake. Photo taken 08/23/16. Florida 597 (Dale Mabry Highway) continues south from County Road 685A by Lake County Park. Photo taken 08/23/16. North Lakeview Drive circles east from this traffic light as the main route to a number of subdivisions associated with the North Lakes development. Photo taken 08/23/16. North Lakeview Drive returns to Dale Mabry Highway at the subsequent traffic light opposite Northgreen Avenue west into an apartment complex. Photo taken 09/07/14. Built in 1984 as Northdale grew in population,3 Vivian Gaither High School resides on the west side of Florida 597 between Northgreen Avenue and Mapledale Boulevard. Mapledale Boulevard provides both access to the school and a connector to Northdale Boulevard. Photo taken 08/23/16. Northdale Boulevard comprises a multi-lane boulevard west from Dale Mabry Highway to the Northdale community. Northdale was developed in the 1970s on a 1,300 acre site that was previously home to a dairy farm and cattle ranch. The Northdale Golf Course opened in 1979, with population growth continuing through the 1980s.3 Photo taken 08/23/16. Carrollwood Springs Boulevard loops west from Florida 597 (Dale Mabry Highway) to The Arbors community and Ehrlich Road. Zambito Road ties into the intersection from the east as a back route to Bearss Avenue. Photo taken 09/07/14. Ehrlich Road travels west as the main arterial between Northdale and Carrollwood en route to the Veterans Expressway (SR 589) and Citrus Park. Bearss Avenue extends east as a multi-lane boulevard to Lake Magdalene, Interstate 275 and Bruce B. Downs Boulevard at New Tampa. Photo taken 08/23/16. Bearss Avenue east from SR 597 was formerly signed as County Road 678. A remnant of that status is this reassurance marker posted for SR 597 south after the intersection. Photo taken 09/07/14. North Village Drive winds southeast from South Village Drive through the Carrollwood Village golf course community to intersect Dale Mabry highway across from Handy Road. Handy Road links SR 597 with the eastern section of Ehrlich Road by Bay Lake. Photo taken 09/07/14. South Village Drive constitutes a tree lined boulevard wrapping around the Carrollwood Village community from Ehrlich Road to Florida 597 (Dale Mabry Highway) at Fletcher Avenue. Fletcher Avenue, partly unsigned County Road 582A, forms an important east-west route across Carrollwood to north Tampa and the USF campus. Photo taken 09/07/14. The last southbound shield assembly for Florida 597 stands beyond Fletcher Avenue. Photo taken 06/26/15. Stall Road links Dale Mabry Highway with Orange Grove Drive by Lake Ellen to the east and south Carrollwood Village to the west. Photo taken 09/07/14. Hudson Lane provides a second link to parallel Orange Grove Drive through Carrollwood at the next southbound signal. Photo taken 09/07/14. Lake Carroll Way angles southwest from Lake Carroll and Orange Grove Drive to intersect Dale Mabry Highway by Carrollwood Center shopping plaza. Photo taken 06/26/15. A series of guide signs precede the folded diamond interchange between Dale Mabry Highway, Gunn Highway (CR 587) north to Citrus Park and Busch Boulevard (SR 580) east into north Tampa. Photo taken 06/26/15. An off-ramp departs beyond the forthcoming traffic light with Linebaugh Avenue for Florida 580 east to Busch Gardens in Tampa and Temple Terrace. Photo taken 06/26/15. Linebaugh Avenue intersects Florida 597 (Dale Mabry Highway) just ahead of the junction with Florida 580. The avenue comprises a local road to adjacent White Trout Lake and as a cutoff to Gunn Highway north by the Plantation community. Photo taken 06/26/15. Three lanes of Dale Mabry Highway continue south as Florida 580 toward U.S. 92 (Hillsborough Avenue) and Raymond James Stadium in Tampa. All traffic bound for Florida 580 (Busch Boulevard) east and Hillsborough County 587 (Gunn Highway) north depart in unison to the right. Photo taken 06/26/15. Taking the off-ramp from Dale Mabry Highway to Busch Boulevard, motorists approach a signalized intersection with Busch Boulevard east and Gunn Highway west. Florida 580 travels south of White Trout Lake to connect the Carrollwood area with Lowry Park and Sulphur Springs in Tampa to the east. Photo taken 09/07/14. County Road 587 extends 14.64 miles northwest along Gunn Highway from Dale Mabry Highway to Florida 54 at Odessa in Pasco County. The route consists of a commercial arterial northwest to Citrus Park Mall. Photo taken 09/07/14. Span wire supported signs direct motorists onto Florida 580 (Busch Boulevard) east. The state road parallels a CSX Railroad line three miles east to an interchange with Interstate 275. Photo taken 09/07/14. Atmore Grove Drive west at Dale Mabry Highway (SR 597) and the Veterans Expressway (SR 568) westbound beginning in Lutz. Photo taken 08/23/16. "Who was...?" TropicalTurnpikes.com retrieved from web site archive. "Hillsborough Cancelled Freeways." Bayciti - Tampa Bay Urban Blog. Cozart, Justin, April 6, 2005. August 25, 2015. "After 40 years, Northdale no longer in &apos;middle of nowhere&apos;." Tampa Bay Times, May 6, 2015.